Once again‚ the pendulum has swung. Jim Lauderdale's previous album Could We Get Any Closer (Sky Crunch‚ 2009) was nominated for a Grammy in the Bluegrass category. 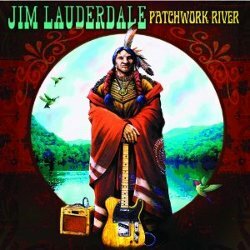 Given Lauderdale's changeable nature‚ it's no surprise that Patchwork River takes a different direction altogether. Less country than The Other Sessions‚ less mystical than his dance with Donna the Buffalo on Wait til Spring‚ Patchwork River settles into the place where country twang and hippie groove intersect with the sweat and croon of soul. Think Memphis on a platter‚ and you'd be close to the mark. Co-written with Lauderdale friend and Grateful Dead lyricist Robert Hunter‚ the songs on Patchwork River tell stories of the righteous‚ the ragged‚ the spooky and sublime. From the lost city of El Dorado to the torching of the Everglades and the verities of the human mating ritual‚ the lyrics probe the edges of American life‚ conscious and subconscious‚ then and now. The players backing Lauderdale on this effort feature a who's who of American pop‚ including guitar legend James Burton‚ drummer Ron Tutt (Elvis Presley‚ Emmylou Harris‚ Elvis Costello‚ Jerry Garcia) and steel and dobro master Al Perkins (Rolling Stones‚ Flying Burrito Brothers‚ Buddy Miller). Garry Tallent from the E Street Band holds down the bass‚ and Nashville hotshot Kenny Vaughn gets in some licks on the six-string. Take a band like this‚ and you can go places--and Lauderdale does. Much of the record has a throwback sound. The warbling keyboard and punchy horns of "Louisville Roll‚" has a classic 70s soul vibe. The spare‚ stinging guitar and primitive drums that open "Jawbone" slide into a funky‚ Skynardly mash. But "Turn to Stone" is more contemporary--a nod to Nashville‚ 2010‚ and as such‚ a candidate for pickup by a major country recording artists‚ which has happened with many of Lauderdale's tunes. Jim Lauderdale gets work across the industry with his gorgeous pipes. He's appeared singing backup on countless albums and toured with the likes of Lucinda Williams. His voice is a big part of what happens on Patchwork River. But he's an understated singer‚ and the real story here is the band‚ as tight and focused as anything Lauderdale has done before. There's nothing patchwork about it.